Stamping forming is a very common process in sheet metal products manufacturing. Tooling life is up to hundreds thousands shots. 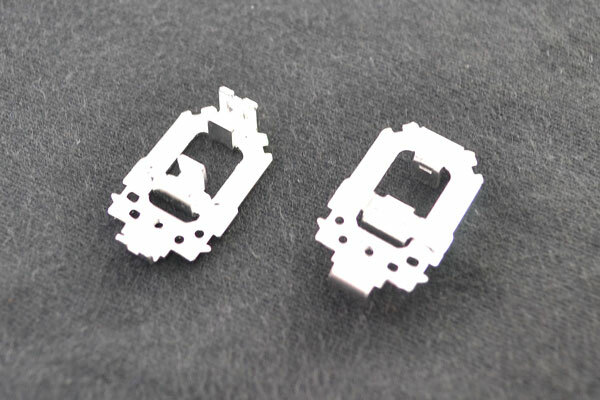 Compared with other machining process, stamping process shapes the product once at a time. In general, the stamping die can be finished dozens of times in a minute, for some advanced equipment up to hundreds and thousands in minutes. It not only saves time to set up the machine but also reduces the cost. In this project, we used progressive die to produce the cable holder, which is a multi-stage part with different holes. There are many different size holes on the metal product and each of them has particular distance. So it requested that the die was designed around a very specific feed length. Based on the design, we set it up to 15mm and control it throughout the whole forming process consistently. The five pierced holes were the first station of the progressive die, and the second stamp station is the C shape, after that was the square shape. All set by the accurate punching schedule and feed length. There are 7 blanking punches built on the die in total.